A few more hours and our xmas will be over, (4 to be exact). Yours is all over already. In fact you and Mike are more than likely tucked away in bed by now because it is 2 o’clock in Eau Claire. I’ll try and describe our xmas here although it’s probably won’t be very interesting to you. We had all day off so naturally we all slept till about noon. Then we went up to the mess hall for a light lunch, lounged around all afternoon eating candy, nuts, and fruit cakes here in the hut and then went back to mess for our xmas dinner. We had roast turkey with all the trimmings and then each of us was presented with a gift package from the Red Cross. I got a checker-board, candy, and cigarettes. Better practice up on your checkers game. If you are not wide awake I’m liable to do some jumping!! Tonite the company is putting on a play in the mess hall but I’m sitting down here in my hut writing you instead. It’s quiet now because I’m all alone and I did want to write you on xmas. A man would be strange indeed if he wouldn’t be thinking about his family on a day like today. Yup, sweet-heart, it’s lonely without you. It’s colder today that I have seen it in a long time. The wind is blowing about a hundred per and the snow is drifting. It’s really miserable. The fellows just blew in from the Xmas play so it will, (in fact it is) be plenty noisy in here. I hate that, with everyone yelling and raising hell all the time. We all get on each others nerves here, we’re such good friends by now that we argue easily I guess it’s only natural! Speaking of something that’s natural, that’s what I call my really needing you. I didn’t think that a man could be affected as badly as we all are here. Hell, that’s all we ever talk about, think about, and dream about. Can’t help that my letters are that way then either, can I? How is Rebecca? Did she have a good Xmas? I wonder that it would be like if we could spend a Xmas together. We’d hang up the stockings with care — and the pants too! How about that? What’s new with the off-spring? Did you have a nice Xmas, honey? I hope so. Gee but I love my little wife. I’d give a lot of lettuce to see you tonite. Next Xmas we shall be together or I’ll be goofy. We heard a lot of good radio programs today. The people back home are really “giving” when it comes to radio programs. The cream of the copy was on all day today. Well, darling, enough for now. Just a few lines to let you know that I am thinking about you and have been all day. 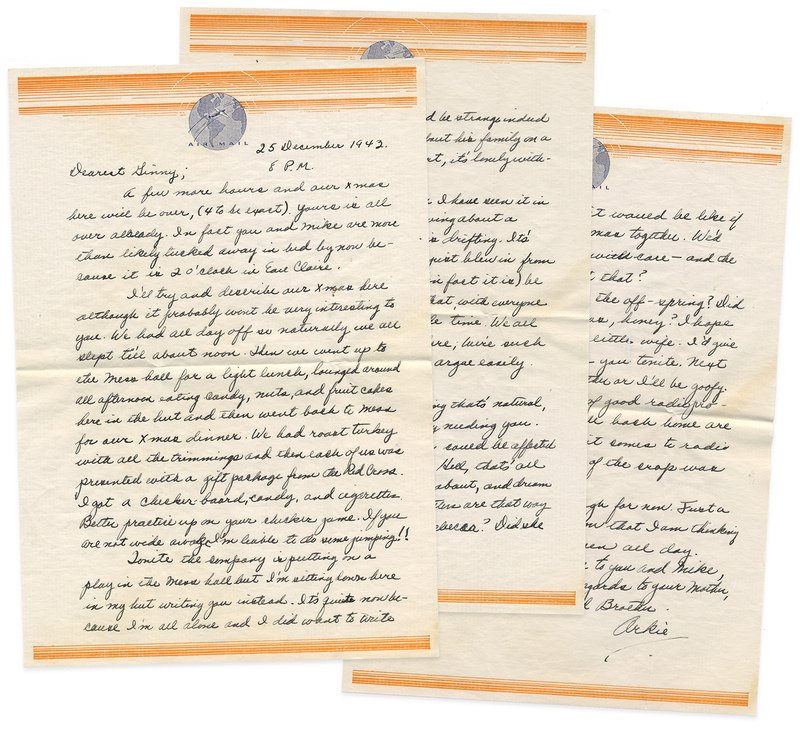 Want to read another letter from Albert Kohnen (aka “Arkie”) to his wife? Click here.